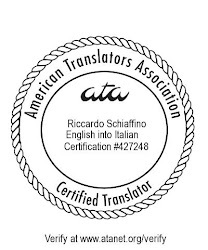 About Translation: "The sorrow with any translation"
"The sorrow with any translation is that you're never really quite there, [but] you may be someplace almost as good." A translator must strive to see the work in its own terms, [Ruden] believes, while knowing that such a goal will always be just out of reach. "But it's something that you keep pushing and pushing and pushing, until you pass out from exhaustion." The entire article is very much worth reading, and a welcome change of pace from the humdrum translations we might be working on.